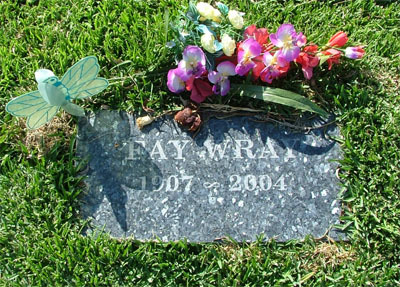 The simple and elegant marker for Fay Wray's final resting place. 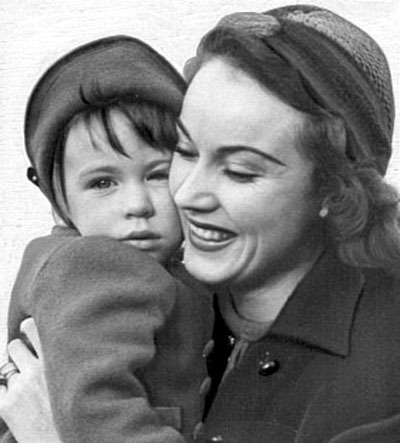 Fay Wray and daughter Susan. Fay Wray's final rest under the Hollywood sign. The newly planted willow tree will provide shade for future visitors. A glamorous portrait of Fay Wray. 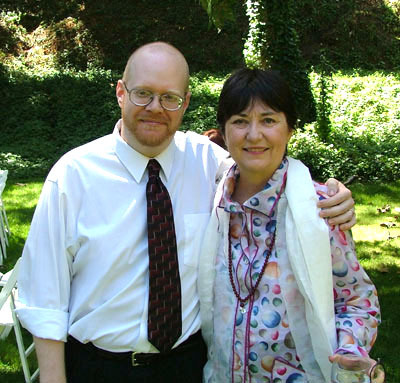 Steven Hill with Vicki Riskin after the backyard memorial service in Los Angeles, 12 September 2004. A portrait of Fay Wray from "One Sunday Afternoon". I'm writing this while flying 30,000 feet over southern California heading for Chicago. I was going in the reverse direction less than three days ago, on an American Airlines late night flight to LAX. I'd made arrangements to stay with my good friend Scott Woodard in Burbank. 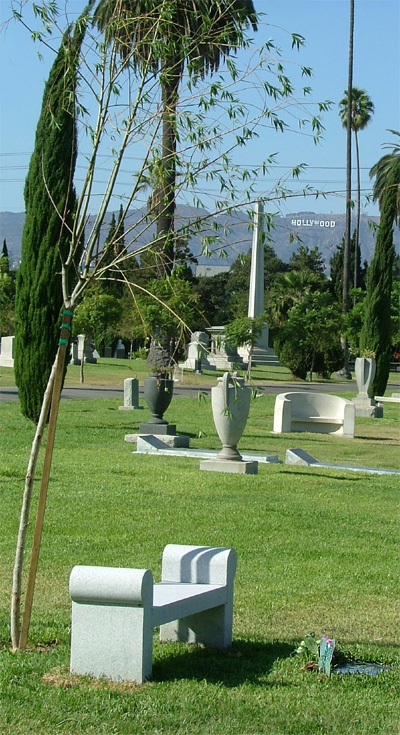 Scott picked me up at the airport, we stopped to have a bite to eat at the Big Boy, then got to sleep as quickly as possible to be refreshed in the morning for my journey's ultimate destination: a backyard memorial service for the legendary actress Fay Wray. My association with Fay Wray began as nothing more than an admiring fan. Back in the relatively early days of the world wide web, when I first paid an exorbitant amount of money for some web server space, I set out to make a variety of sites that focused on things that interested me. 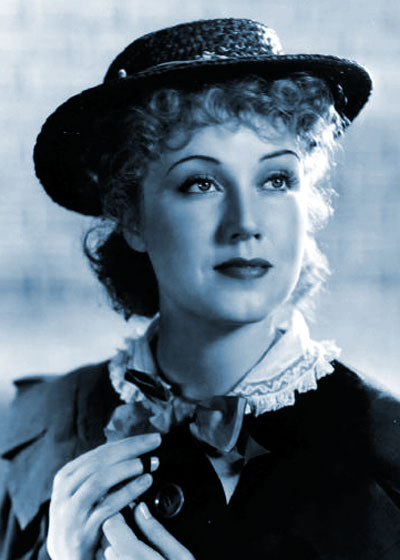 I wanted to create a website for Fay Wray, my favorite actress, and felt that it was all the more important because there was, at that time, no significant web destination for information about Fay. I'd recently searched in vain to buy a copy of Fay's 1988 autobiography On the Other Hand, and had to settle for a copy checked out of my local library. Armed with the knowledge from the book, along with several of her films in my collection, a good number of stills, a scanner and video capture device, I designed the website and filled it with content. I wrote to popular film critic Roger Ebert explaining my project and asking if he'd supply my front page with a quote. His response helped make the main page stand out: visitors were greeted with "Watching Fay Wray on the screen is one of the great pleasures at the movies. Meeting her was one of my great pleasures in life. - Roger Ebert"
Somewhere on one of the pages in the site, I included my home address. This is not something I would do in this day and age of identity theft and concerns about personal security and safety, but if I hadn't done it then I would have never received an unexpected letter from Fay Wray herself after she had been shown the web pages. She enjoyed seeing the web pages and wanted to have some time to talk with me. I wrote back with my phone number, and some time later got a phone call from Fay – just a quick introductory call to set up a time when we could talk for a while. I never got to meet Fay. 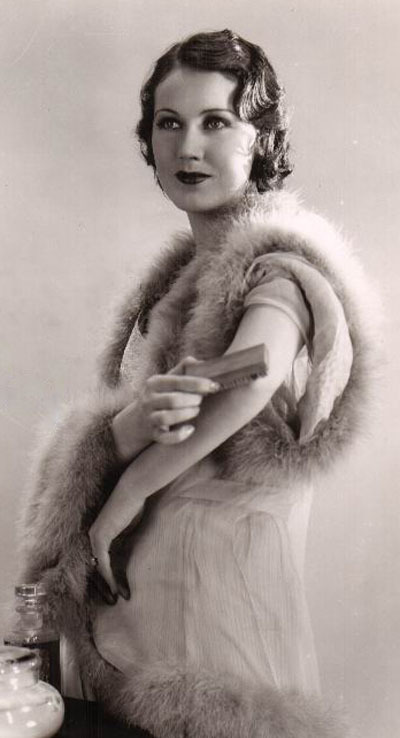 There is no question, though, that Fay was one of the most amazing personalities of the twentieth century (and part of the twenty-first). A friend to famous stars, directors, writers, public figures and presidents, there has probably never been a soul alive who could say that Fay was anything less than warm, kind, loving, caring, intelligent, generous and unforgettable. I felt her warmth and joie de vivre cascading out of the telephone like a waterfall, this wonderful woman talking to me as if I were an old friend. We talked for a long time, about the website, about her movies, about her family and mine. She had seen my picture somewhere on the site, and expressed appreciation for my reddish hair (which is now gone; my bald head gleams where it used to glow copper). Over the next few years we kept in occasional contact, but my own irrational shyness and fear of being a nuisance all too often stayed my hand from initiating a call. I even have a few letters that I wrote to her that never got sent for various reasons. It was my own fault, then, that the two of us had had no contact for some considerable time before her death in August 2004. When my website launched, it included Fay's address for receiving fan mail. Some time later, Fay asked me directly to remove the address and to print an apology to her fans that she could no longer keep up with the fan mail. After that point, I would occasionally receive requests or pleas from people asking if they could get in touch with her for their own special cases. I forwarded these requests (sometimes people hoping for an interview, or a personal appearance, or with a genealogy question) to Fay's daughter Vicki Riskin so she could take the appropriate action. Almost immediately upon hearing of Fay's death, after I had a chance to recover from the awful news, I put a notice on the main web page and promised visitors a condolence book by the end of the day. I sent a note to Vicki expressing my sadness and telling her there would be a book of condolences on the website. Over the next few days, dozens of beautiful messages were left from all over the world and in many different languages… all of the people touched personally by Fay, whether they had ever met her or not. Vicki wrote a lovely open response for publication on the site, and extended me an invitation to the memorial service, which I gratefully accepted. The service was set for 10:00 am. Scott and I drove up the quiet, private winding mountain road that led to the ranch, passing grazing horses on either side. The valet took the car and pointed us to the footpath and little wooden bridge that led around the side of the ranch to the back yard. Several rows of white chairs had been set up in the shade of a tree, along with a small podium and speakers. I had my camera with me, but held myself back from actually using it due to my (once again) irrational fear of acting inappropriately or causing offence. Scott and I took seats, and I, having never met or seen Vicki Riskin, played the game of trying to guess which one of the ladies present would turn out to be she. The rabbi called for everyone to sit, and began the service. The sun was shining gloriously while the sixty-or-so people sat in the shade of the tree, the temperature was perfect, and the stillness of the air was broken only by an occasional light breeze or the sound of a horse walking up the road. Time slowed down for us as we listened to Vicki, Bob Riskin, Stan Winston, Rick McKay and others telling stories full of love and brimming with the glow that Fay managed to spread to everyone she knew. Stan Winston told of how Fay had presented him in 1994 with the official City of Los Angeles proclamation of King Kong Day 1983, a document that now hangs framed in his office in his special effects studio. Rick McKay told the story of how, the day after winning a billion Academy Awards, director Peter Jackson flew to New York to have dinner with McKay, Fay Wray and Naomi Watts, who is portraying Wray's character of Ann Darrow in Jackson's 2005 remake of King Kong. When asked for her thoughts, Fay said, "He's too fat and she's too thin!" There was a sly pause, and then she laughed heartily, touching off laughter that went around the table. Willow Wray sang a song she'd written about Fay, a song she had always hoped to sing for her but never had the chance until then, singing not to Fay's ears but instead to her soul and spirit. We had more stories and thoughts. We had a brief Buddhist prayer in Tibetan. We had sweet remembrances from everyone and tears from many. We had a beautiful morning remembering a beautiful soul. And we will always have and cherish those memories. Thank you again, Fay, for being such an inspiration to us all.